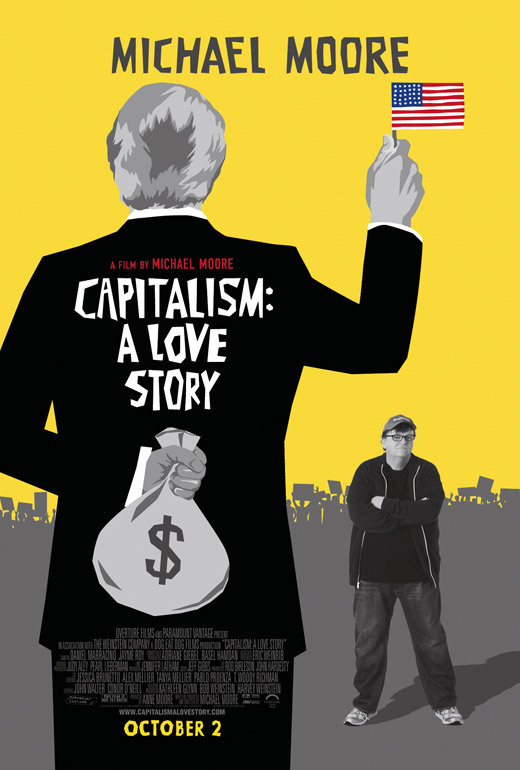 Overture has unveiled the poster for Michael Moore's new documentary Capitalism: A Love Story over on Fandango today. We featured the full theatrical trailer for this doc exactly a week ago. Fandango says it kind of looks like a Saul Bass-style poster, but I wouldn't say that, it just looks like some simple modern vector art. Though it still does look good and I prefer this design much more over plenty of the ugly floating head posters these days. And compared to the poster for Sicko, Michael Moore himself is only featured in the corner this time. At least that might help minimize all the hate he gets on a normal basis. Anyway, enjoy! This opens early in NY and LA only on September 23rd before opening nationwide on October 2nd. I've never watched a moore film (okay, aside from Canadian bacon), but it seems like this one will have me in the theater. Why does he photshop so badly every time he's pictured in something? Is he afraid that other countries will see he's actually another stupid fat American? He's actually much, much heavier than he's pictured to be. Bad Type. Saul Bass it is not! #3 another conservative know-nothing teabagger. Michael Moore is a genius. The right hate him because he tells the truth...unlike them. They couldn't tell the truth about anything if they tried, they are so utterly devoid of reason and sanity. "Socialism: A Love Story" would have been a better title for his movie. yeah he is right, if only having loose facts and a face that makes me wanna punch a kitten, is right, then he's right! The only good part of his docs are probably his attention to detail, getting all the facts, all the info, from both sides, wait...nah I don't care about his topic...just wanted to chime in...I'm kinda board. #5, im sorry but i never read anything conservative that number 3 said. All he said was michael moore was just another stupid fat american. how is that conservative? i mean yes, most people who hate moore are conservative, but his statement wasn't, it wasn't "know-nothing" either. Michael Moore is fat, and he is american. While i don't think hes stupid (even though i find him repulsive), there wasn't anything that seemed to be "know nothing." As for the teabagger comment, I don't believe i heard him complain about taxes. #5....you failed buddy, failed big time. Well thats the liberal mindset instead of proving there own facts they just constantly attack the other side. I have experience in trying to show some libs the straight up facts right in front of them. Instead they automatically dismiss it because they just cant accept that they were wrong. I honestly dont even bother anymore, Im not a conservative either so I dont really have any biased....but from what Ive seen from both sides, liberalism is more of a mental disorder than a political stance. EX: "The right hate him because he tells the truth…unlike them. They couldn't tell the truth about anything if they tried, they are so utterly devoid of reason and sanity." The so called #3 conservative like #9 said, never said anything that related him to being a conservative. But yet he jumps on him for being "an insane conservative". Dont get me wrong though I have met liberals who have more of an open mind but they are few and far between. But I just totally went off topic but to prove a very valid point....I can see the responses to this already. I'm not sure. It reminds me of Saul Bass. Maybe I'm just weird. #5 Read this and let me know if I can clear anything up for you... This movie, like the rest of Moore's 'documentaries', is a giant pile of lies and conspiracies. I don't know why the guy is still living in America. We all know by now he hates America, he bad mouths our nation at every turn and hides behind the idea that he wants to make it better. The vast majority of the people in this nation is happy with how America has prospered over its 200+ year history. Capitalism was not the problem with the mortgage crisis. The banks are not to blame for the mortgage crisis. The insertion and meddling of politics is. When a politician gets his/her hands into something that seems to be working fine, expect disaster. Jimmy Carter (it always starts with Carter, the worst President ever): In 1977, Democratic President Jimmy Carter was in the White House and Democrats controlled both houses of Congress. They passed and signed into law the Community Reinvestment Act ("CRA"), which was designed to prohibit lenders from "redlining" unprofitable neighborhoods. Bill Clinton: In 1993, Democratic President Clinton was in the White House and Democrats controlled both houses of Congress. President Clinton initiated revisions to the CRA and regulatory scheme which substantially increased the number and aggregate amount of loans to small businesses and to low- and moderate-income borrowers for home loans. The revisions also allowed, for the first time, the securitization of CRA loans containing subprime mortgages. The first company to pool and repackage the loans into securities was the now defunct Bear Sterns. George W. Bush: In 2003, President George Bush tried to pass what the liberal New York Times described as, "the most significant regulatory overhaul in the housing finance industry since the savings and loan crisis a decade ago": "The plan is an acknowledgment by the administration that oversight of Fannie Mae and Freddie Mac -- which together have issued more than $1.5 trillion in outstanding debt -- is broken. A report by outside investigators in July concluded that Freddie Mac manipulated its accounting to mislead investors, and critics have said Fannie Mae does not adequately hedge against rising interest rates." The supposedly "stupid" President George Bush attempts to bring a solution to what he knew was a major problem, but the Democrats blocked him. Follow the money: Over the last ten years, from 1989 to 2008, the top three recipients of Fannie Mae and Freddie Mac campaign contributions are...drum roll please: (1) Democratic Senator Christopher Dodd and Chairman of the Senate Banking Committee, (3) Democrat Senator John Kerry. What about number 2 you ask? I think someone stepped in number two because, in less than four years in office, a certain inexperienced, junior Senator from Illinois somehow managed to rise to the number (2) spot in most campaign contributions received from the, now under Federal conservatorship, Fannie Mae and Freddie Mac: Democratic Senator Barack Obama. Change! But of course, Michael Moore won't make a movie about this... instead he wants to go after the industry that allows us to buy the homes we live in and companies to run. He's an idiot. God forbid, if you hate the banks that much, DON'T BORROW THEIR MONEY!!!!! I thought this web site was about movies! Take that stuff elsewhere! Moore should changed the title from "Capitalism" to either Corporatism or Fascism if he wants to be accurate. #16 EXACTLY correct. Capitalism is what makes this country great. It's why our standard of living is the best, our health care facilities/doctors are the best, technology is one of the best, and why people are constantly, constanstly, constanstly, CONSTANTLY flocking to live in America. I am not a Moore fan at all and although I might agree with the negative things he'll point out taht these corporations do, I will not support someone profiting on the criticisms of what make this country the best country in the world. Isn't it ironic that Moore couldn't make these movies (because they wouldn't be watched, allowed, or profitable) in other countries? He HAS to make them in America because of free speech and capitalism and the success of Hollywood that is not the same elswhere. I have the same feelings towards Colbert and the Daily Show. There's always going to be something wrong with American politics, economy, defense, etc. so these media outlets will ALWAYS have something to say and will ALWAYS have idiots watching them because they think it's funny. #17 Haha. You are funny. 14, where was his epic fail? care to actually explain or are you just gonna not back up your beliefs. Capitalism: an economic system based on private ownership of capital wordnetweb.princeton.edu/perl/webwn Socialism: a political theory advocating state ownership of industry an economic system based on state ownership of capital wordnetweb.princeton.edu/perl/webwn Communism: a form of socialism that abolishes private ownership a political theory favoring collectivism in a classless society wordnetweb.princeton.edu/perl/webwn Ok champagne socialist yuppie liberals--which one do you prefer? ANYONE on here who agrees with the point of this movie--I suggest that in order to avoid being a HYPOCRITE (like the ultra capitalist Michael Moore) that you turn over all of your possessions to the state and live in the projects, because THAT is the result of socialism and it's ultimate result--communism. You need to look up the words that you are throwing around and understand the implications of supporting such concepts.